I started out last week determined to cook a few more experiments. I wanted to focus on vegetarian options since our box generally contains meat. 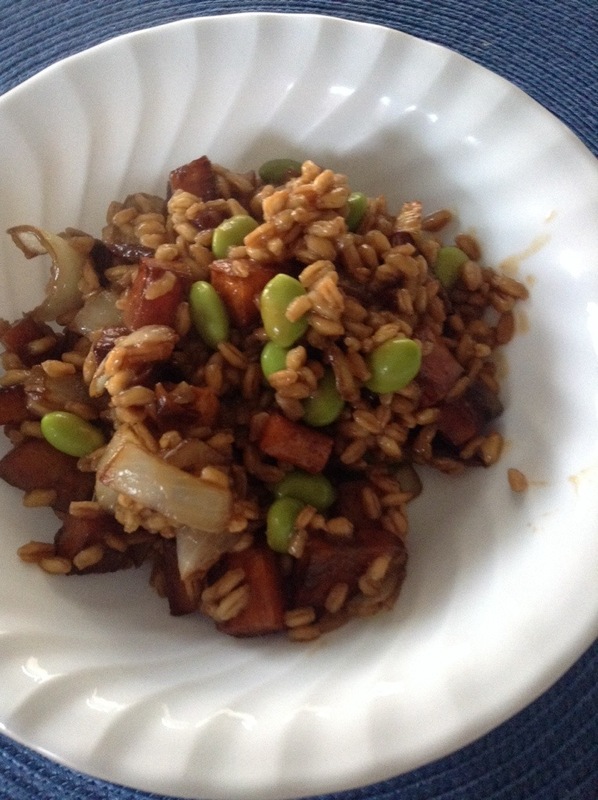 I started out well with a farro risotto with sweet potatoes. I went with roasted onion and sweet potato and cooked the farro risotto style, coating the grains initially, deglazing with wine and slowly adding broth. 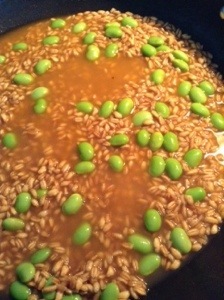 It seemed to be going well, so I added some shelled edamame I had on hand (well. I had the edamame but had to shell them myself – it was kind of fun). I kept cooking until all the liquid had been added, the mixed in the roasted veggies and some finely grated cheese. I *think* I used the Swiss from the last cheese box, but I can’t exactly be sure. All in all this was pretty good. 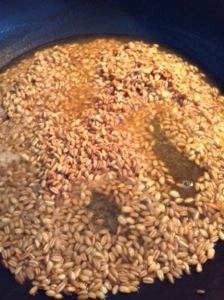 I do think next time I need to cook the farro in the regular style in broth and just mix everything together at the end. Bob liked thus dish and didn’t seem to mind the lack of meat. Then Monday came and all my plans and good intentions went out the window. Monday started a icky week where I got sick and work got insane. I was sure it was a full moon on Tuesday, but nope. Just regular old insanity. This being the case, I went easy for dinner. 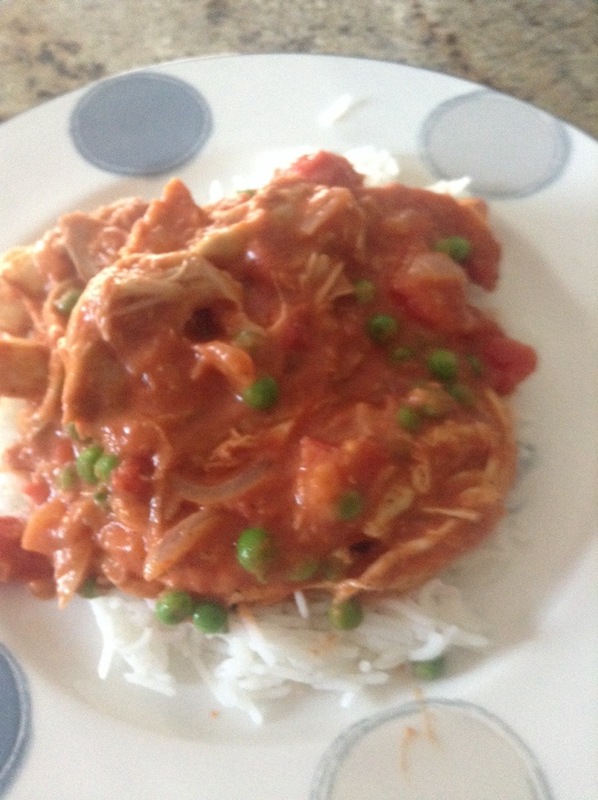 I picked up a chicken at the store (yes, pre-cooked) and used it as my base for Butter Chicken. I love the food at the Indian place near us, but most of the time I look at recipes and want to weep. Tons of spices that I just don’t keep on hand, and I few I’m not sure where to find. I managed to find a recipe that wasn’t too hard and managed to have things I had in the house. So … I managed to put together a dinner (with a few changes, obviously) that was pretty good and not too difficult. For Tuesday, when I really started to catch whatever was going around, I wanted simple, fast and mild. Not tasteless, but something that wouldn’t kill my stomach. So I took a quarter cup of honey, a quarter cup of soy sauce, a few tablespoons of sherry vinegar. two cloves of garlic and some ginger and mixed it up. 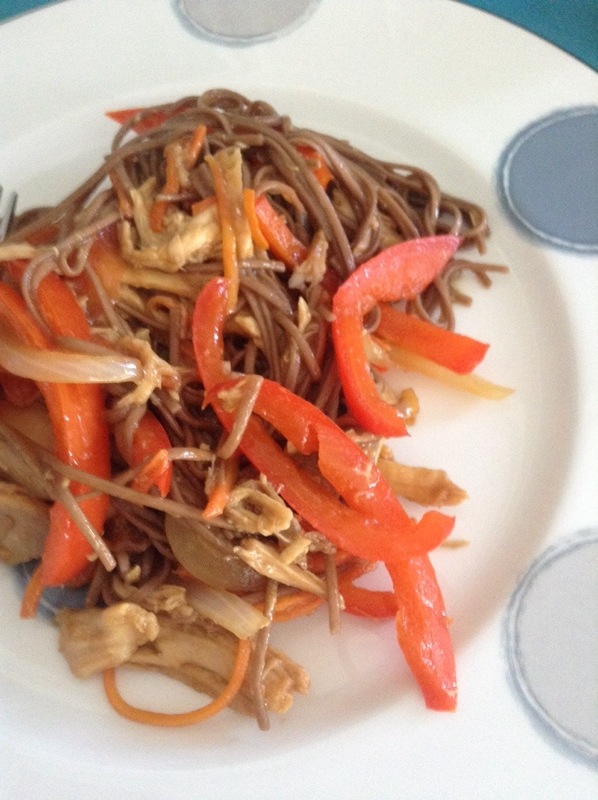 I sautéed onions, carrots and red peppers together in peanut oil and shredded some more of the chicken. 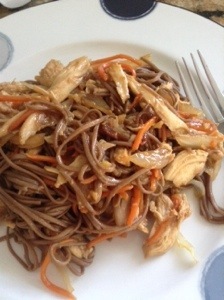 I boiled up some soba noodles (big fan of those) I added the chicken and noodles to the veggies, poured the sauce over it all mixed and cooked for another minute. and both of us were happy. Bob told me to put this one in the rotation, which does say a lot. I’m back to feeling normal and counting down to spring break where I can, hopefully, get some things around the house done.